Loving your neighbor: A young man with some mental disabilities regularly passed by the Reading Room on his way to another store. He didn’t appear to have any friends, nor willing or able to speak much to others. I made an effort to converse with him whenever I saw him and see him as his true spiritual self—whole, good, alive, and joyful. He gradually began to respond—first with a “hi” and more and more conversation. Also, he grew from a low almost grunting voice to clear wording. We’ve become fast friends now, and he has managed a job working in a grocery store. More about God: A man wandered in to say, “What is this place?” He was visiting his grand children from out of town. He had never read the Bible and didn’t have any religious beliefs to speak of. I said Christian Science teaches God is love and we can see and feel that love everywhere. God is everywhere. Mary Baker Eddy, who discovered Christian Science, sought a deeper meaning of the Bible that we can use in our life today. 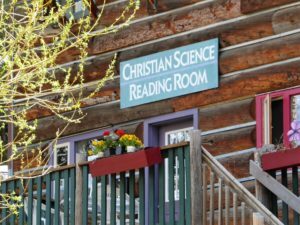 The man continued to visit the Reading Room almost daily during his stay for more conversations about God and Christian Science. We had a great sharing together about spiritual truths. 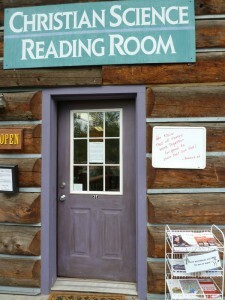 Getting Science and Health: A young couple passed by and curiously stepped in to find out more about the Reading Room. They were full of questions about Christian Science: what it is and what does it offer. Before they left, the man was so interested that he bought a Science and Health (the Christian Science textbook) to take with him and use to follow-up on our chat. An Atmosphere of Love: A man walked in with his dog named “Monster” and said he just needed a moment of quiet and to feel love. He asked for a hug and, as I gave him one, I said that God’s divine love was embracing him every moment. He said he was a Christian but had fallen away from grace. I said in truth he could never fall from grace. I asked if he would like to look around or discuss anything. He replied that he just wanted that moment of quiet and was glad we were there. He sat for a while and eventually said that he got what he needed from the “atmosphere of love.” He said, “Good bye” and was on his way. Praying Together: Some young people came in to sell homemade bread for an outreach program that offers drug rehab and homeless shelter. They were so enthusiastic about helping others through their trust in God. We shared some thoughts about really “loving our neighbor,” and I gave them some Christian Science literature on the topic. We then all prayed together. I had been thinking about the meaning of the First Beatitude, as I prepared for Sunday School: being humble and knowing your need for God. This all was an example of that. Helpful Christian Science magazines: A young man came in asking for work. He and his wife were temporarily staying in the basement of the Lutheran church. We talked about God. He had felt abandoned and that his situation was proof that he was undeserving. I assured him of God’s love for him and his wife. – and that they were both worthy in God’s eyes. He took some Christian S cience Sentinel magazines, and left expressing his gratitude and asking for my prayers of support. Searching for Truth: A young woman was outside intently reading the scriptural message in the window. I invited her in and asked what I could do for her. She replied, “I’m searching.” That opened us up for a 45 minutes conversation about God, Christian Science, and the healing power present in our lives. She asked if there was a book she could read to find out more about it all. I gave her a small paperback of the Science Health as a gift. We talked about so many things… It was a wonderful and thoughtful conversation. The Christian Science Monitor: A man from Kansas stopped in while he was waiting for his granddaughter in the shop next door. He just wanted to express his gratitude and praise for the Christian Science Monitor international newspaper. Although not a Christian Scientist, he’d been a subscriber to the Monitor since 1962! He bought some current editions of the Weekly Monitor, and said he would stop back to enjoy the quiet place when he comes to town again. Love for the Bible: A man stopped to read the Bible quote posted outside the Reading Room: “Brethren, be perfect, be of good comfort, be of one mind, live in peace; and the God of Love and peace shall be with you” (I Cor. 13:11). I introduced myself and asked what caught his attention. He said he loves scripture. I said there is a great talk tomorrow in Denver on the Psalms and showed him the flyer. He read it carefully and said he like to take one. He did with hopes of attending the talk. A single mom helped: We had a visit from a young single mom—with lots of human needs. She was drawn by the word “Christian” to come in the door and get some help. She stayed a long time as we visited about Love and God’s care for her—great ideas from the current Bible Lesson on angels and listening for inspiration that leads to practical solutions. I also shared the recent Sentinel magazine with “God’s Mothering Love” on the cover—a mom and a child under an umbrella. It fell open to the article, “Trusting God one day at a Time.” The visiting woman loved that. We also talked about practical community resources available to assist—and possible job ideas. The young mother left so appreciative and looking to return.